In the last episode: The return of the eight saw eliminated cheftestants back for a chance to get their aprons back. Only two were left standing, Josh and Ryan. They then faced a unique elimination test: they had to cook a fruit tart and the six remaining cheftestants would choose the best in a blind taste test. Josh won and returned to the team. Once again the cheftestants faced a Mystery Box but this time with something alive inside, namely spot prawns. Once again they had to produce a stunning dish. We learned Monti has a real problem with living things she has to cook. Hint to Monti-do not get a job in Asian restaurants where live food is on the menu! It almost was comedy watching her try to get a prawn out of the aquarium. Water was splashing all over the place even drenching Gordon Ramsey. Off to the side you can see Joe actually smiling watching Monti’s discomfort. Eventually a prawn she is trying to get falls out and Gordon picks it up for her. One wonders how she would have handled that a live dungeness crab a few episodes ago. After the usual watching the cheftestants prepare their dishes, the judges confer as to who are the three they want to try. Becky sets a record by being in the top three five times, a MasterChef first. Christine comes up next with a prawns in pineapple broth that is well received. And the surprise, David is called up! His avocado infused dish wins praise and the win. He gets to head back to the pantry to see what major advantage he will get. He gets to pick one of three ingredients–bacon, corn, beets–that everyone will cook as a dessert. He picks corn and they show him three corn flavored deserts currently popular and can ask questions about their preparation. This is a major advantage to be sure. He decides to go for a corn infused rice dessert like his mother used to make. Additionally he gets five minutes in the pantry to get everything he needs. And just as he exits he realizes he forgot rice. Your heard it right-he is making a rice dish and forgot the most important ingredient. The door is closing to the pantry as he tells the judges, who quite understandably are dumbfounded. They cannot waive the rules so he has to go back to his station. Needless to say, it looks grim for David at this point. After the competition starts up, David frantically tries to get rice from the other cheftestants. Only Becky has rice she got as a backup and gives it to him. Now David has no excuses and begins working on his dish. Time is finally called and the cheftestants present their corn themed desserts to the judges. Joe found the dish “Really, really, really inedibly disgusting.” Graham said he should have asked Becky for sugar as well and called it “weird” and his worst dish. Gordon said he struggled to find corn and needed serious spices. Joe likes the presentation and calls it delicious as does Graham. Gordon says she keeps getting stronger and stronger. Joe says it looks simple but complex flavors. Gordon is impressed and finds it delicious. The strange looking profiteroles have Graham wondering if it is novelty cat poop and not even a profiterole. On U.S. Navy ships they have an ice cream dispenser (soft) called auto dog by many. That is what these profiteroles do look like and they are nasty looking. Gordon says they have no texture, wet on wet, her worst dish. He says she was in his top three. Joe is even more pointed saying it was raw, not sweet, and not even profiteroles. Both Gordon and Graham found it delicious. Gordon likes the chocolate grenache in particular. When Frank walks up to present his dish, he glances over and says he thought it looked wrong. Josh says his dish will win. Unfortunately it completely fails. The judges find it visually uninspiring, Joe thinks it too sweet, the others agree it was visually unappealing. Becky wins top honor and Frank second. Both will captain teams next time. The judges are very disappointed in all three but send Josh back to his station. Felix is sent home and David is safe for another round. This was a good episode. Challenging the chefs to prepare spot prawns forced them to deal with live food, something real chefs contend contend with (usually with seafood). All the dishes looked pretty good and it was nice to see Christina in the top three. The fact David pulled out a win was remarkable considering his lukewarm performances in the past. Its obvious he has some talent but not enough to pull him all the way to a complete win in MasterChef. After being giving such a tremendous advantage, he blew it by (1) forgetting the rice, (2) preparing and serving a substandard dish. Had Becky not given him the rice, he would have probably gone home for missing a key component of his meal. Some ask was it right to give him rice? Frank argued that it was the nice thing to do and really what counts in the end was his product. Most when asked said they would give him rice but Josh would refuse saying this was a competition. One can argue that giving him rice saved him for another day. Perhaps it did but the judges thought Felix was the greater culinary disaster. Several episodes ago both were challenged to do a tiramisu. She did a free-form style layering and it looked hideous, put macadamia nuts in it, and had all the wrong flavors. David’s was not much better with over soaked lady fingers and nuts on it as well. Gordon said the nuts were wrong and instead of picking him up, his tiramisu put him down. The judges, in particular Gordon and Graham, likely decided enough was enough and she did not have the chops to go on. I suspect Joe wanted to send David home for his awful dish. Both showed their weaknesses and why David is unlikely to go to much further unless several of the front runners suffer catastrophic failures sending them home. It is possible by sheer luck he could end up being in the top four simply because someone else does worse. He lives on the edge of a sword but sooner or later will get cut. Next week they are running restaurant service in a Michelin star restaurant. This is where we will see who really has chef material working in a real restaurant. It looks like something akin to Hell’s Kitchen may erupt! The remaining six contenders all entered the kitchen last night expecting to cook and found themselves in the gallery watching 8 previous contenders duke it out for a MasterChef apron. It was good television and provided more sales for heartburn medication as the 6 remaining chefs were worried as to who might come back. You had Stacey, Josh, Tali, Anna, Tanya, Scott, Cowboy Mike, and Ryan all battling it out in a Mystery Box of their own choosing. Each one had to select one item from the pantry that would be part of what they cooked. And it was a strange one indeed. You had portabello mushrooms, pork chop, celery, condensed milk, chocolate buttons, pomegranate, white wine vinegar and heavy cream! The judges were aghast no one choose a starch, spice, tomatoes, or onions. So off went the 8 into battle making a dish that would put them in the top two for the apron. And we saw some really good cooking here. Nearly everyone pulled out all the stops to make an impressive dish. Both Josh and Ryan were surprised that David Martinez was still there. David, classy guy that he is, gave the middle finger salute to Ryan as he said that. He was dumbfounded when Josh said the same thing. David has had his moments but has had lots of things go wrong as well. Luck has been on his side more than talent in my estimation. Finally the judges taste all the food. Josh did a chocolate mousse. Graham thought it did not look great but it tasted delicious, as did the other judges. Tali did a chocolate dish that was heavy or as Joe put it like “a mortar.” For once we did not get a clip of Tali saying how the judges cannot understand his creativity. Most of the other dishes were good with slight problems. Ryan produced a pork chop with mushroom and celery ragu that Gordon said it was the best dish he cooked. Stacey put up homemade pasta, ricotta cheese, pan seared pork chop and ravioli. Gordon said she had one hand on the apron as a result. Alas it was not to be. Instead it was Ryan and Josh left standing. One must assume both dishes showed great finesse and talent but I really thought Stacey had nailed it. Stacey is someone I expect to hear about in the future. Her trajectory is heading on to bigger things food wise. Some might argue that the judges wanted Josh because he is more popular but I doubt that. And Ryan did put up a really delicious dish that made him a contender. So now the two have to prepare a delicious (and as Gordon puts it stunning) fruit tart. Here is the rub: the six remaining will determine the winner in a blind taste test. Both Josh and Ryan get to work on their tarts. Ryan looks less confident but prepares a traditional looking tart with strawberries and other fruits. He also put maraschino cherries, which I have never seen before on a fruit tart. Josh goes for tropical fruits. For a while there it looked like Josh was in serious trouble but he pulled it out and both presented really nice looking fruit tarts to the judges. After slicing and plating their dishes, the servers take them into the restaurant where the six are seated waiting to taste. They have no idea who made what, their decisions based solely on presentation and taste. We learn what many of them think, most like what they have tasted. So where did the vote go? All six voted for Josh! Ryan ends up taking a second walk out. He certainly is a decent cook that will probably improve with more training. However his arrogance and bad talk will not make him many friends. Not sorry to see him go and Josh will likely add a lot more tension in the next few cooking challenges. I suspect Felix or David to be the next to go. Monti could screw it up but I doubt it. As I see it, the final four could be Josh, Frank, Christine and Monti. Becky is talented but has too much confidence and more easily rattled in high pressure contests. Take some time off to come back to find lots of news stories to sift through! Actually it was not that bad since I filter out a lot of stories that have no bearing to Titanic at all. Some just mention Titanic as a descriptive like “it was a match of titans” or it was a “Titanic event. ” Of course there are the usual cliches like the infamous “rearranging desk chairs” that seem never to go out of style. Pity that politicians just seem to love to use Titanic. It crosses borders and parties as well. Over at Premier Exhibitions, the word seems to be silence. No word on what is going except that negotiations are continuing regarding the artifact sale. They got title to the salvaged artifacts but can only sell it as one piece limiting sales to only mega corporations, museums or consortiums with very deep pockets, or wealthy oil princes in the Middle East. Perhaps China will buy it up and make it a tourist attraction. Stranger things have happened. Premiere Exhibitions reported that its profits are up for the first three months that ended 31 May. They report a 9 percent jump resulting in $1.2 million or 2 cents a share. Last year at the same time it was $1.1 million and 2 cents a share. Overall revenues (before expenses) were up 19 percent to $11.5 million from $9.7 million. Their acquisition of Arts and Exhibitions International LLC–which has King Tut II, Cleopatra and Real Pirates (and others) as part of its programs–added to the bottom line. Ticket prices however went down during the period (no doubt to attract people) by 7.6 percent. Titanic II appears to be rolling along. Still in the planning stages (actual construction has not yet started) but Clive Palmer already has said he will likely exclude everyone but first class passengers from its casino. He says he did not want people not able to lose money to go there. Nice sentiments but Las Vegas has no such qualms. As long as your money is good (and not one their list of banned people) you can gamble as you wish. Some people do get foolish and gamble too much. There are some who do get addicted to gambling but that is a special category. And those people, like alcoholics, need counseling to deal with this problem. Palmer likes to remind that Titanic II will have all the latest in safety technologies, be wider than the original for stability, and offer nice amenities. Hopefully they will not serve Titanic shaped ice cubes in the bars. Robert Ballard has been in the news recently. The Turkish government asked him to assist in locating the downed fighter craft shot down by Syria. Since his ship was docked in Turkey already for an expedition, he went out and located it in Syrian waters. Still up for debate is whether the Syrians had any legal right to shot it down (if it was in their airspace they will claim they had the right while Turkey says they did not). Ballard’s ship Nautilus is exploring the Black and Mediterranean seas this summer looking for Byzantine era ships and to observe marine life. You can check out their progress at www.nautiluslive.org. An article in the Daily Mail once again asks the question whether or not Lusitania was carrying illegal munitions that contributed to its sinking in 1915. On 7 May 1915, a German submarine torpedoed the liner which sank rapidly taking 1,198 lives. Controversy swirled from the very beginning because there were two explosions. One was the torpedo and the other no can ascertain for sure. Some speculate it was munitions for the war in Europe put on board illegally, others that it was coal that ignited as a result of the torpedo. Greg Bemis, who is co-owner of the wreck and believes that it went down as result of illegal munitions, is conducting dives to the wreck to determine what happened. The wreck lies 300 feet down off the coast of Ireland near Cobh (Titanic docked there in 1912 but it was Queenstown then). The water is murky making it hard to see and cutting into the hull takes time. Weather of course makes it difficult. All of this is for a documentary that will reveal what they found. It was a major news story back in 1915. Europe was at war with England/France/Russia on one side vs. Germany/Austria/Turkey on the other. Lusitania was a civilian vessel and many Americans were aboard. The German embassy had placed notices in newspapers warning such ships were subject to attack. The German policy of unrestricted submarine warfare allowed them to target military and civilian vessels of its enemies. Its sinking angered America and President Wilson. However it did not lead to American entry into the war (that came in 1918 thanks to the infamous Zimmerman Telegram). Like people who believe President Roosevelt knowingly allowed the Japanese to bomb Pearl Harbor on 7 Dec 1941, there are those who argue the same for Lusitania. They argue the British (in particular Churchill) wanted the Americans in the war and put the illegal munitions on the ship knowing the Germans would get the blame when they torpedoed her. No real proof exists (though lots have been written to support it) that is the case. A lot of post-World War I history is written from the point of view, that America was sucked into that war by the British and that Lusitania was part of it. Turning away from Titanic, I have been watching MasterChef(Fox-USA). I like this show. Unlike the other shows (except maybe for Food Network Food Star) all of the participants are amateurs and mostly home cooks. A few have some restaurant experience as food runners, servers, burger flippers, or breakfast serving, but most learned from just doing it at home sometimes with their parents or others around them. What is surprising is the creativeness and quality of dishes presented. The judges–Joe Bastianich, Graham Elliot, and Gordon Ramsey–put the aspiring MasterChefs through a lot of hurdles to get the best of the best. Along the way you get interesting challenges and personalities. This season has also seen lots of changes. Obviously aware that shows like these become predictable, they have chosen to shake things up to make it less so. For instance, usually at the end of a mystery box challenge they call down the three best they want to try. However at the first one, the three they called down were judged by them (they walk around and taste the dishes and talk with the cheftestants) to be the worst. They also have mixed up the elimination challenges by having the winner select who cooks what in that challenge. It adds a lot more stress and strategy. Choose right and you might send home someone who was a competitor. On the other hand, you might end up helping the very people you want to eliminate as Ryan found out to his embarrassment. Sadly some of the challenges send favorites away like Josh (who really excelled in most challenges but the egg pressure test was his doom). Christine, who is blind, has proved to be very creative in her dishes despite an obvious impediment. And it is never certain who wins or loses. For instance, Ryan was pleased to think that Monti had screwed it up by using canned crab to make scotch eggs. At first Gordon thought she was nuts but upon tasting realized it was delicious. Tali, never known for anything particularly great, did produce a delicious strawberry shortcake while Becky, a front runner, produced a trifle that looked beautiful but was very bad. So the show keeps you guessing as to whether the people you think are good will in fact cook well to survive to the next round. The worst offenders are easy to spot. Generally they serve undercooked food, miss key components required, or poorly executed dishes. Or you do something totally bizarre like baking cheddar cheese on top of your apple pie or putting unthinkable combinations in risotto. You know how bad it is when Joe takes your dish and tosses it into the trash. Your only hope is someone has done worse (and that has happened). Give MasterChef a watch. I think you will like it. Search For Titanic books and DVD’s At Our Titanic News Store! Back in April Dennis Drabelle, Washington Post contributing editor, wrote about Titanic books but got the date it sank wrong. He wrote it sank on 15 April. Oops! 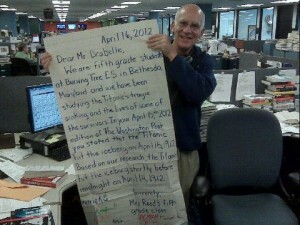 That prompted a letter, actually a very large one, from a fifth grade class at Burning Tree Elementary School in Bethesda, Maryland. We are fifth grade students at Burning Tree ES in Besthesda, Maryland and we have been studying the Titanic’s tragic sinking and the lives of some of the survivors. In your April 15, 2012 edition of The Washington Post, you stated that the Titanic hit the iceberg on April 15, 1912. Based on our research, the Titanic hit the iceberg shortly before midnight on April 14, 1912. That about says it all. Here endeth the lesson. Exploring the ocean has been the theme of many over the years. Robert Ballard, amongst the others, argue there is much to be learned in exploring the deep. Over at MastersDegree.net there is a graphic about we need to explore the ocean. Take a look at it by clicking here.